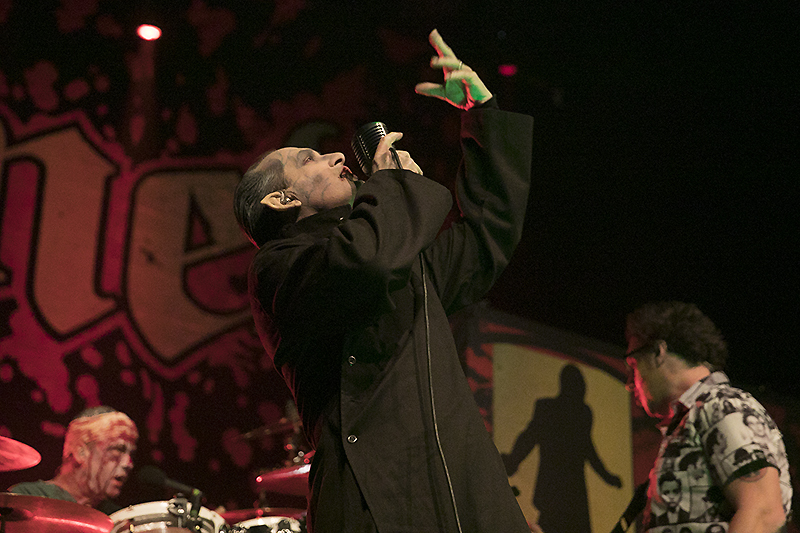 The Damned are always phenomenal to see live but their Halloween show at the Regency Ballroom was next level cool. 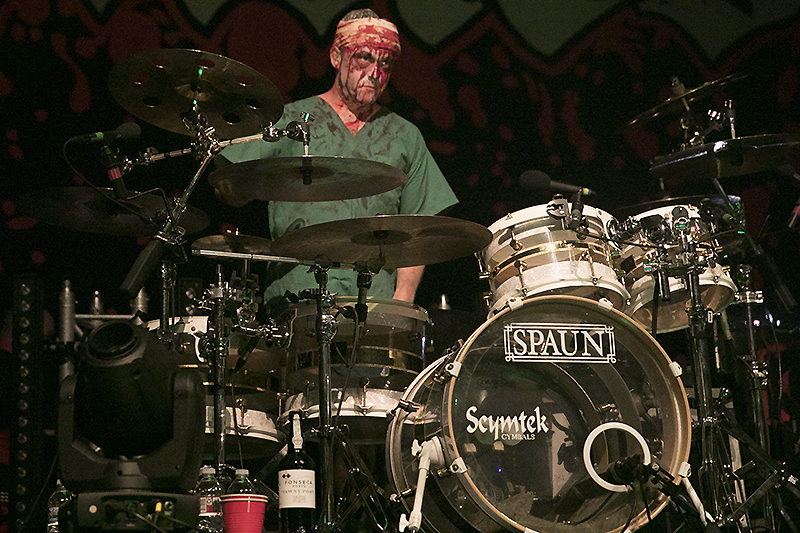 The guys clearly love playing in San Francisco and they love Halloween as well and the results were magical. 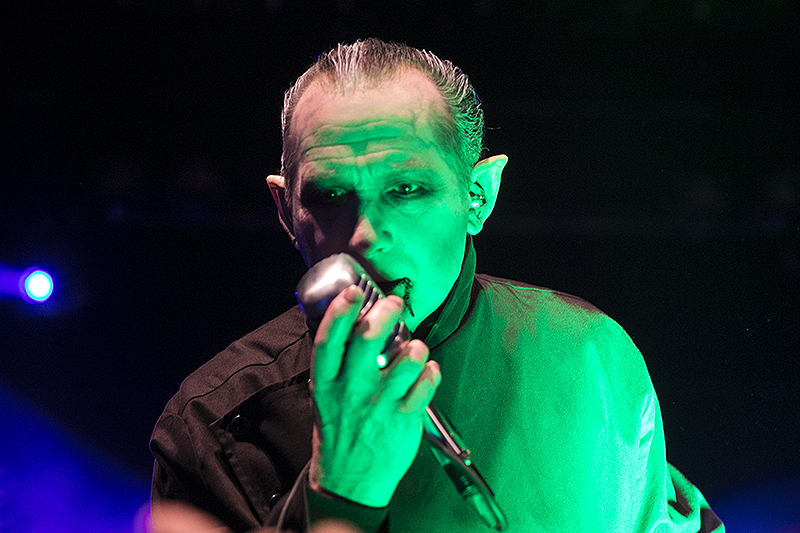 Singer Dave Vanian looked absolutely amazing dressed as the vampire Count Orlok from the 1922 silent horror film Nosferatu. Wearing a floor length Victorian black overcoat and pointy ears, he slipped in and out of character from being the vibrant singer of a punk rock band to creepy overlord waggling his fingers and spewing fake blood capsules that he’d grabbed at the drum riser while sipping glasses of wine. Vanian was more animated than usual and connected with the crowd by kneeling down, grabbing hands and making raised eyebrow faces at them. 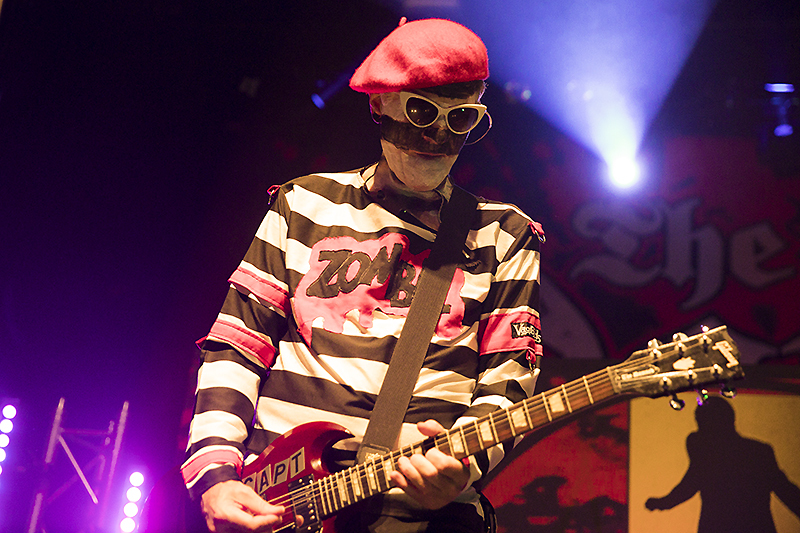 Never to be outdone, guitarist Captain Sensible wore a black and white striped jersey with the words “Zombie” emblazoned on the front and his face painted in black and white stripes, which went surprisingly well with his signature red beret and white framed sunglasses. Aside from looking fantastic, the band sounds amazing. It’s hard to believe these guys have been around since 1976 because they still give a fiery performance and appear to be thoroughly enjoying themselves. 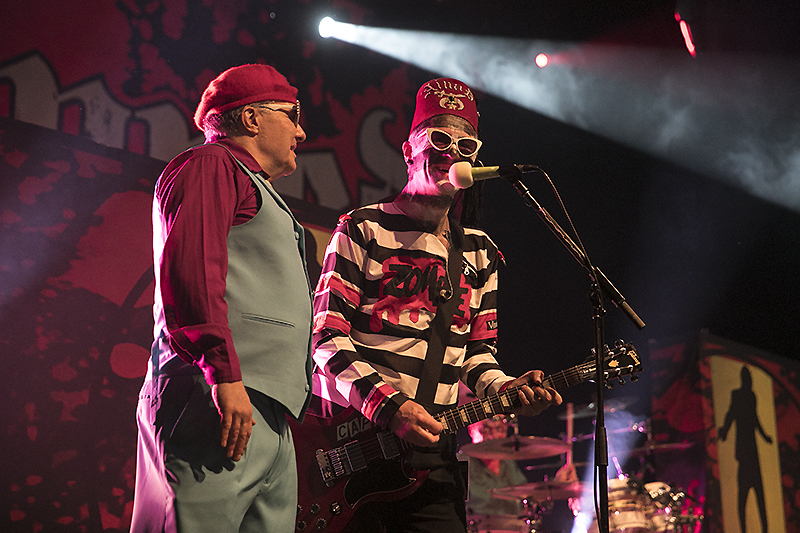 The Damned started off the set with a few slower numbers while the semi-costumed crowd yelled for their faster hits. They were ready to mosh and could hardly contain themselves. Songs like “Dr. Jekyll and Mr. Hyde” set the tone perfectly for this Halloween night though and gave Vanian a chance to twirl and make dramatic poses while a green floor light shone on his face. 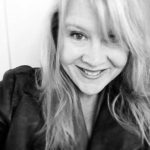 A few songs in and the pace sped up a bit with “Standing on the Edge of Tomorrow” and “Wait for the Blackout,” which led the crowd to gentle pushing while singing along. Sensible was given a new song to sing with “Silly Kids Games” which the crowd loved; he finished by yelling, “I’ve still got it you bastards! !,” while everyone cheered. Vanian showed off his vocal chops with “Eloise,” a challenging romantic ballad to sing but he didn’t miss a note. The show really kicked in to gear with “New Rose” and its lead-in line, “Is she really going out with him?,” emphasized by pounding drums that got the crowd going berserk. Keyboardist Monty Oxymoron took the opportunity to escape his position off to the side and do a Bugs Bunny-like tap dance center stage with his huge afro billowing around, which stirred the crowd up even more. They finished the set with “Neat Neat Neat” and returned later with two encores. The first one featured the super-charged “Ignite” with some fancy guitar work by Sensible and a crowd sing-a-long of “Oh Whoah Oh Whoahs” that lasted a few minutes while Vanian and Sensible passed their microphones over the top of their heads. They finished the set with a cover of the Sonics’ song “The Witch,” which the band said they’d never played to a live audience before. It rocked pretty hard. The final song of the evening was a lively version of “Smash It Up” featuring Jello Biafra singing backup while wearing a red fez and doing a dance that could be described as the frantic backstroke. Jello’s been showing up at some of the punk rock shows in town lately doing guest appearances and we love him for that. All in all it was another fantastic show by the legendary punk rockers. We hope they keep doing their thing and as long as they do we’ll keep coming. Hopefully they’re back in San Francisco real soon. Find out more about The Damned on their website.